Add some gaming flair to your bedroom with this squishy Nintendo Switch pillow! Each ultra cuddly plush comes filled with soft fleece and is available in four huge sizes. The perfect spot to take a nap after a hard day playing the Switch! Bring your favorite electric type Pokemon to life with this 3D animated Pikachu hologram! This mixed reality kit lets your experience the power of Pikachu’s Thundershock attack with the use of your smartphone. These custom made Pokeballs are ideal for extra fat Pokemon such as Snorlax! Not only do they give your Pokemon more space to relax, but the gigantic replicas also come with a stand and actually open up so you can store small items. 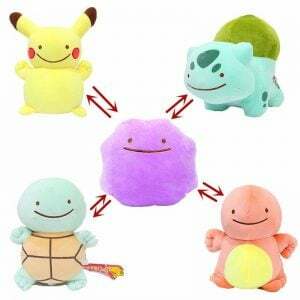 The Pokemon world’s latest addition is now in pin form! Nuttboi, uh, I mean Meltan first seen in Pokemon Let’s Go Pikachu and Let’s Go Eeeve has been fan made into a shiny gold and silver enamel badge. Display a piece of Hyrule in your home with this Legend of Zelda inspired LED shadow box! Each shadow box art piece measures 26 cm squared and comes fitted with bright LED lights that can be controlled remotely. Experience a throwback into the 90’s with these 3D printed Pokemon Game Boy cartridges, Comes in a set of the three original Game Boy Color cartridges, so maybe you should share some with your close Pokemon buddies. Your favorite 8-bit hedgehog has raced back into fashion just in time for the Christmas holidays! This not so ugly Christmas t-shirt will make you feel as though you’re reliving the glory old days as Sonic stands amid a winter themed level. You better hope there’s nothing inside as you burn one of these candles! The Pokeball inspired candles are made from all natural soy ingredients, accented with a sparkly gem button so you can light up your home like a true Pokemon Master. While this lamp may not contain Fire Flowers, coins or mushrooms, it’s perfect for adding some Super Mario flair to your home. The Question Block lamp gives off a bright, nostalgic glow and works well hanged over any couch or table. 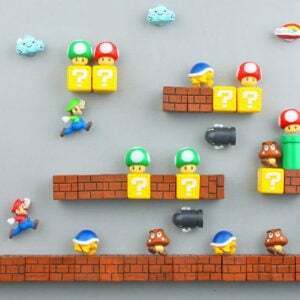 Get creative in the kitchen and build your very own Super Mario Bros levels! This set of 3D fridge magnets feature iconic characters, enemies and items, ensuring that your fridge will never be the same again. HADOKEN!! Take control of the horizontal playing field by using the special Hadoken attack! This fantastic and fun plush perfectly replicates Street Fighter’s most iconic attack. Throw it at your enemies or friends! Planning on opening your own Pokemon Gym? Then you’ll definitely need some Gym Leader certification in recognition of your great achievement! These custom made novelty prints allow you to show off your Pokemon team to other Trainers! Wear everyone’s favorite marshmallow-shaped hero as a pair of cute stud earrings! These super awesome accessories are hand made from polymer clay and are perfect for the earlobes of any girl who’s a Kirby fan! Tired of earbud wire spaghetti? This handmade Piranha Plant will make a cozy home for your earbuds while also showcasing your geeky side! The handy keyring means they’ll also be easily found as you can attach them to your purse or keys.